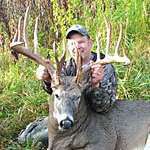 The investigation focused on the unlawful harvest of a 36-point non-typical deer scoring 261 5/8 and valued at $35,000. Charges have been filed against three individuals after an 11-month investigation by the Illinois Department of Natural Resources (IDNR) Office of Law Enforcement in a deer poaching case. The three men were cited for numerous Wildlife Code violations including the illegal take of a potential state-record whitetail deer, and now face charges through the Grundy County State’s Attorney’s Office. The investigation focused on the unlawful harvest of a 36-point non-typical deer scoring 261 5/8 and valued at $35,000. Charges were filed after a thorough investigation with assistance from the New York State Department of Environmental Conservation, U.S. Fish and Wildlife Service, Ontario Ministry of Natural Resources, Wyoming Game and Fish Department, Alberta Sustainable Resources Department, Minnesota Department of Natural Resources, Missouri Department of Conservation, and Montana Fish, Wildlife and Parks.